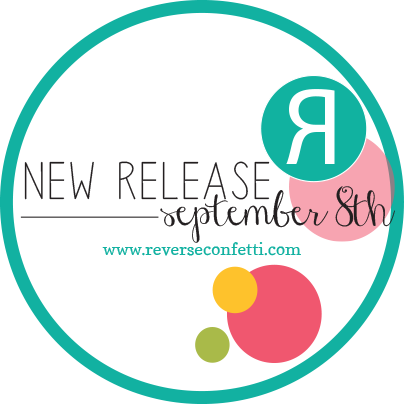 Hello Everyone today mark its Day 3 - Reverse Confetti Countdown September Release. 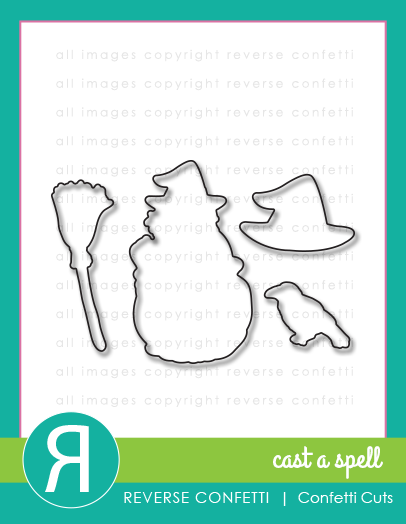 CAST A SPELL Stamp Set and Coordinating Confetti Cuts. To begin I first cut the top corner of the card base with We Are Memory Keeper Corner Chomper. Then, stamped the entire card base with the acorn image from GIVE THANKS then distress the top with Wplus9 Sweet Nectar Dye Ink and did some splottering on the card base using the Distress ink Vintage Photo. 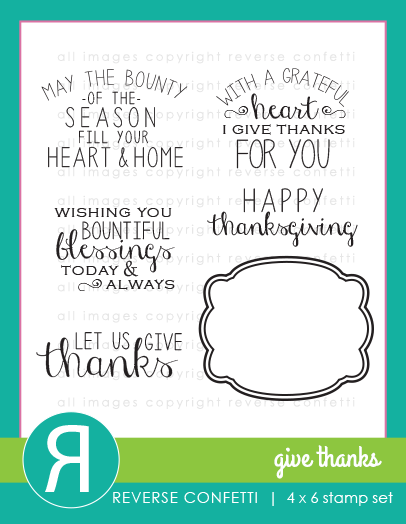 Next I adhere some Maya Road trim, adhere the die-cut sentiment from the GIVE THANKS stamps along with the border image, and the coordinating dies. The fussy cut acorn image was from QUIRKY CUTIES: SAMMY SQUIRREL. Here's the full view of the card. For my second project I then distress the bottom of the card base, then did some splatting for Studio Calico Shine. 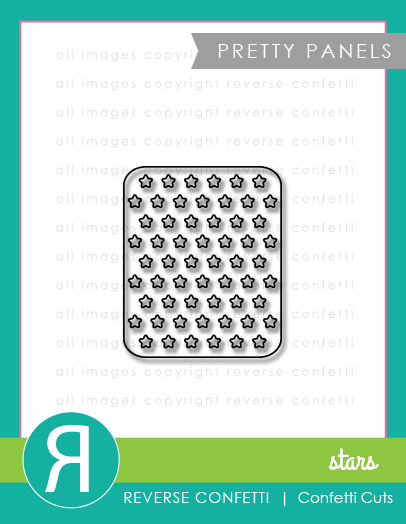 Next I adhere the die-cut PRETTY PANELS: Stars. I also used the circle die-cut from Circles ‘n Scallops Confetti Cuts. which also was distress then adhere the tiny stars from Pretty Panels: Stars and the broom from CAST A SPELL stamps and dies. The sentiment was also from the CAST A SPELL. To finish off the card I added some Pretty Pink Posh sequins in Onxy, Sparkling Clear, and the wood veneers stars from Nature Embellishment Kit. 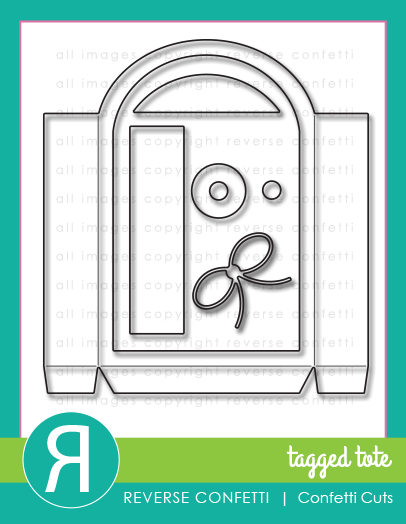 I also used the Tagged Tote for the giveaway with the card. 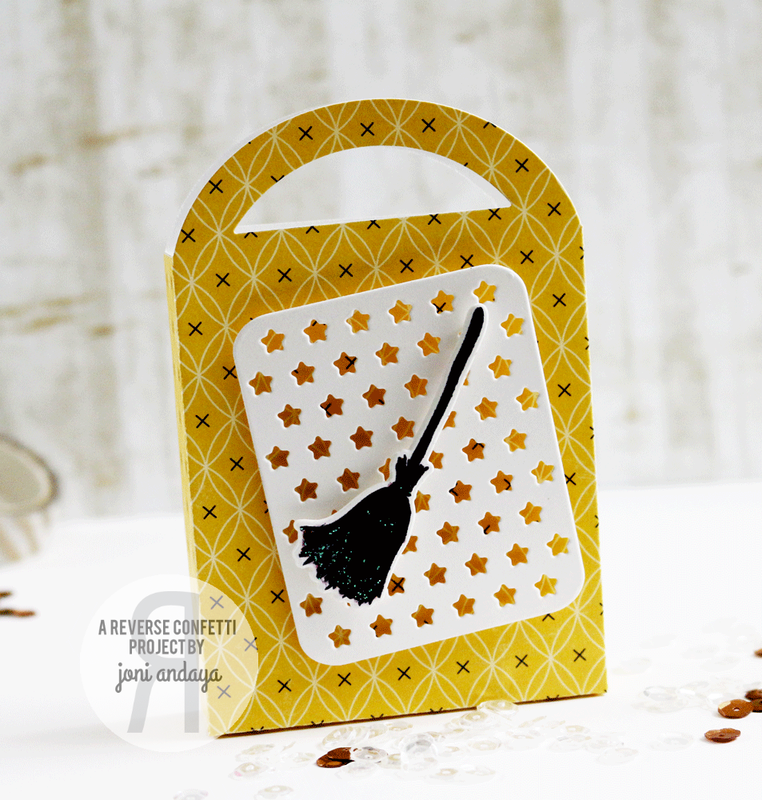 I die-cut the TAGGED TOTE on a patterned paper and adhere the PRETTY PANELS: Stars and adhere the broom on top. Here's the look of the finish card and tote. There will be two $15 gift certificate up for grabs. One Blog commenter, one for Facebook commenter. Don't forget to leave a comment on each designer's blog post to increase your chance to WIN. Comments will close at noon CST on SEPT 7th and the winner will be announced at 5pm on SEPT 7th on the RC Blog and Facebook page. First one Beautifully shabby n loved the spooky card !! Wow girl, you've been busy! I love your gorgeous cards and that little treat bag is just adorable! I love all three, Joni. The tote in a patterned paper, and the use of all those stars on the set gives me inspiration. I like the acorn background on the first and all the stars on the other projects. 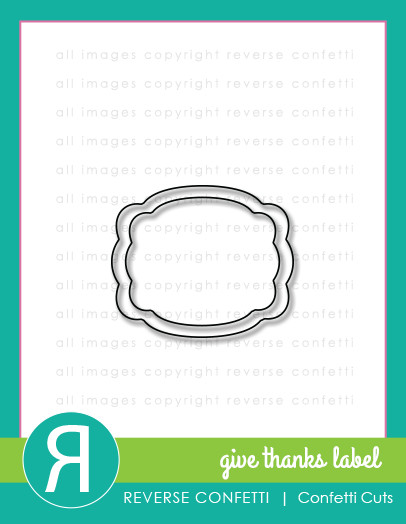 I love the simplicity of your thanksgiving card! And I love the acorn background! Your cards are fantastic. I love the backgrounds. 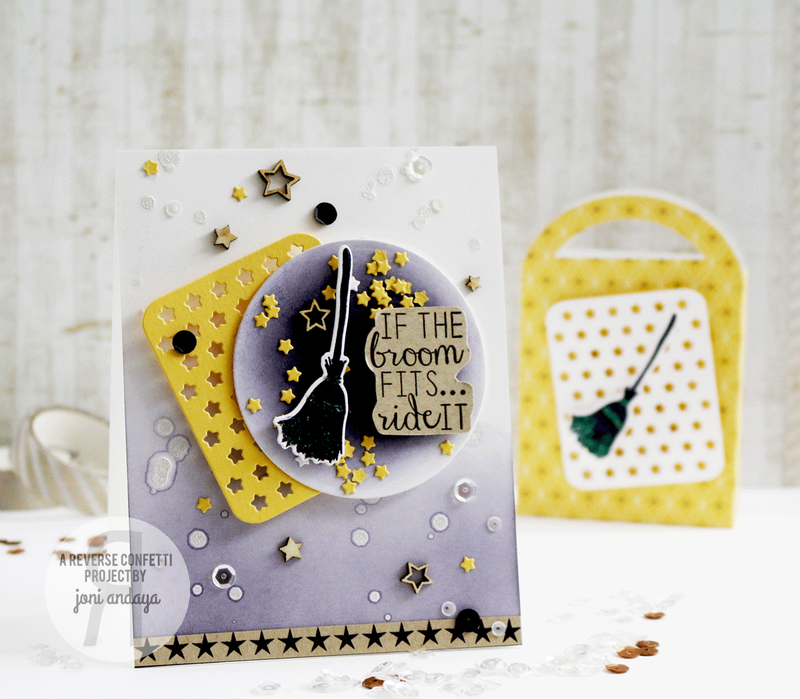 Super cute cards - love all the layers and stars on the Halloween card and love the new release. Love your Halloween card Joni! I love all your wonderful cards and treat bag! The cards are great. I love how you stamped the background on the first card. The pretty ribbon and the splatters really make it pop. The card and tote for the second project are so pretty. OH MY - your thankful card is a DELIGHT Joni - what can I say - I LOVE IT ALL, SO ELEGANT & SO SWEET!!! Your Halloween card is GORGEOUS ... it's probably not the right thing to say, but it is to me, LOVE your inking, LOVE the splatters & sequins, LOVE the scattered stars with the starry die cut underneath!!! Your treat tote is pretty too. Fantastic cards Joni. 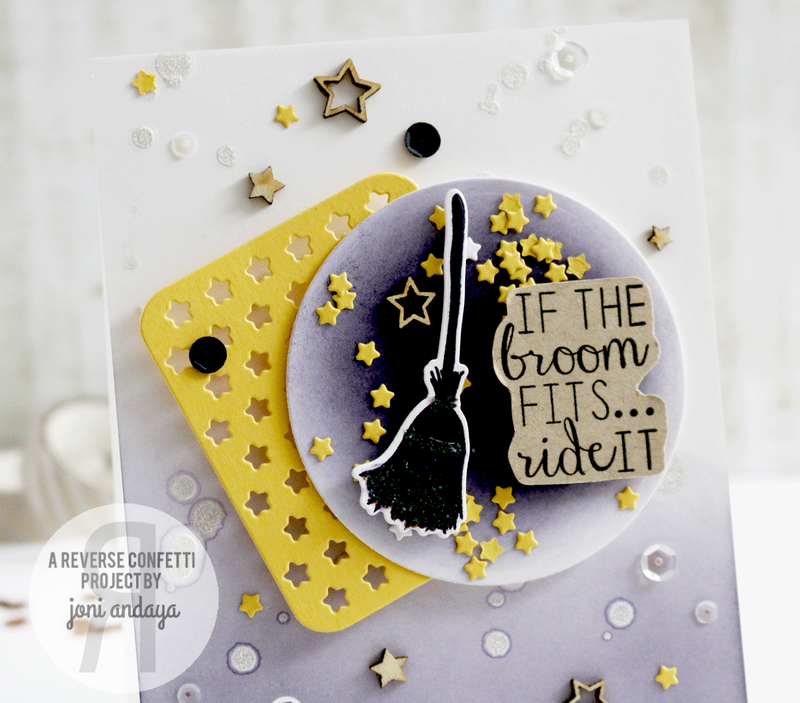 Love the backgrounds with the soft sponging and the die-cut pieces. The last card is just awesome! So many different elements put together to perfection. Wowzers!! These projects are genius!! You totally rocked this release!! What a fun batch of projects! Love the new release! Fun fun fun projects Joni! Love them. Fabulous projects! Love the soft, pretty colors on the first card, fabulous layering on the second card, and that adorable tote! Love that Pretty Penels: Stars! love how you mixed all the elements together! Fun! I like how you used the cut-out stars. That star panel is one of my favorites from this release. Haha - fabulous cards - really love the broom sentiment!! I LOVE your cards! Like how you used the acorn to create both a background and embellishment on the first card. Love the sentiment on your second card. It made me laugh. 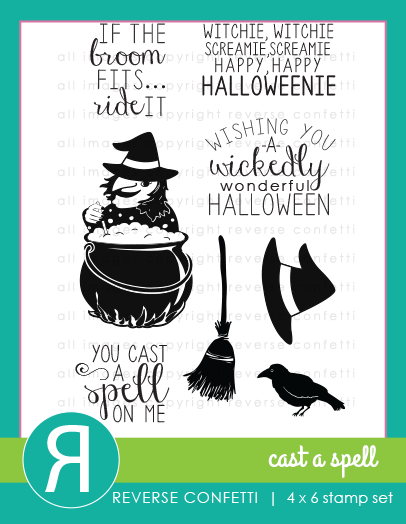 I don't make Halloween cards, but there are really great sentiments in this set that can definitely be used anytime! !